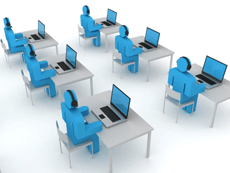 ACI has over 10 years in Help Desk and Service Desk support operations that include both commercial and government clients. ACI is fluent in a number of incident tracking applications to ensure that all notifications are monitored from start to finish. The application of an efficient Help Desk can gauge the customer satisfaction level, assess the usability of a product, and track recurring incidents. This leads to more accurate FAQ’s, on-line resources, and training. It also removes the unnecessary burden of developers and programmers working directly with the end users. By utilizing the incident tracking system, the management team can gather metrics and spot repetition patterns. ACI‘s approach to Help Desk/Service Desk consists of utilizing the Information Technology Integration Library (ITIL) process and the IT management process most commonly used by the US Government. We have level one certification and over three years experience with the ITIL processes and framework. Post-incident surveys will provide feedback to management on how quickly the issue was addressed, the professionalism of the support staff, and the accuracy of the resolution.